“The year is 1924. The cobblestoned streets of St. James ring with jazz as Britain races forward into an age of peace and prosperity. London’s back alleys, however, are filled with broken soldiers and still enshadowed by the lingering horrors of the Great War. Eric is certain that one of his fellow members is the murderer: but who? Captain Mortimer Wolfe, the soldier’s soldier thrice escaped from German custody? Second Lieutenant Oliver Saxon, the brilliant codebreaker? Or Captain Edward Aldershott, the steely club president whose Savile Row suits hide a frightening collision of mustard gas scars? A Gentleman’s Murder is murder mystery novel inspired by the Golden Age of Detective Fiction. It follows all the rules of the genre (the Knox’s “Decalogue”) save for rule no. 5 (“no Chinaman must figure in the story”). It is set in the world of the military and retired officers’ club. The story particularly address the question of PTSD (or, as it was called then, “shell shock”) and, to a lesser extend, “the soldier’s disease” (aka morphine addiction). As the author says in the book (p. 322) “Some scars weren’t visible. And some deaths weren’t physical.” The novel also talks about racial bias, as the character, who is half-English and half-Chinese, often struggle to be taken seriously because he doesn’t look like a gentleman. The author has probably drawn from his personal experience as he made his military service in Singapore (a city-state with the dual British and Chinese heritage) and is himself of Chinese origin. The author seems to favour the post-WWI era because it is a beautiful era and doesn’t involved the complex methodology that investigators have to deal with in modern times (like DNA)—the mystery must remains in the reach of the amateur sleuth. As the author write in his postface, the 20s was a delicious time to write about because it was an exciting age of transition: you still have in place all the Victorian manners and mores but also all the innovation brought by the modern world (like telephone, radio, cars, electricity, etc.). The story, which includes several unforeseeable twists, is very well written. The characters are detailed and quite believable. It seems that lots of efforts were put in describing all the setting with rigour (although most of the locations are fictional). Crime novel (particularly if set in the 20s) is a prolific genre and it’s hard to have such story not feel a little cliché. The only other caveat I can see is that the story offers so many characters and the protagonist takes so much time to imagine each possible permutation of culpability and action for EACH of those numerous suspects that, after a while, it gets a little tiring and confusing. It is almost impossible for the reader to guess who the murderer is — but, in this case, it is probably better that the dénouement come with a surprise. A Gentleman’s Murder is a good novel. It is agreeable to read and, like all good murder mystery, you go through each new chapter with anticipation, reading faster and faster as the climax approaches. I recommend it warmly particularly because it is written by a local author. Christopher Huang, although born in Singapore, now lives in Montreal. The publisher, Inkshares, is also of interest. It is a reader-driven publisher, which means that their books and authors are selected not by editors but by readers—through contests, pre-orders (as a form of crowdfunding you need 750 pre-orders to get published) and how much interest an online draft of the story is getting (i.e. follows, shares, and reads). Authors will receive 35% of net receipts (gross revenue minus the cost of production and distribution) in exchange of a full publishing service (editing, design, printing, marketing, as well as both direct and wholesale distribution). That seems a fair deal. It is an improvement on the self-publishing type publisher, where a publisher will “assist” an author in publishing his/her book. A good example of this type of publisher is the indie ebooks distributor Smashwords (one of my friends is using this service). Would-be writers have more and more options to publish their work. 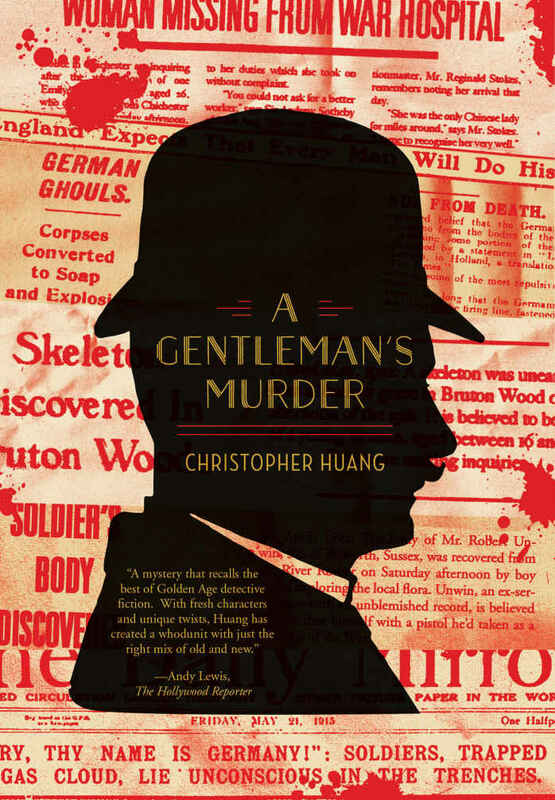 A Gentleman’s Murder, by Christopher Huang. Oakland: Inkshares, July 2018. 348 pages. US$ 15.99 / C$ 19.99. ISBN 978-1-94264-595-5. For young adult readership (16+).